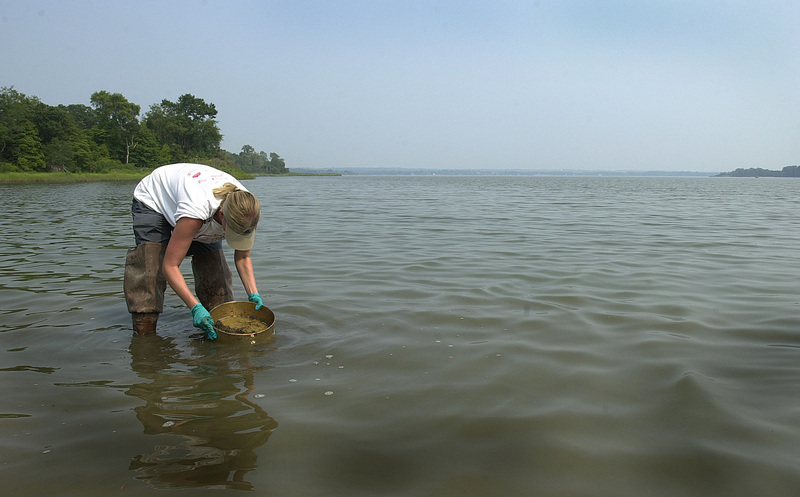 A scientist samples sediment to determine the impact on bottom-dwelling creatures. Several federal laws charge NOAA with evaluating the impacts of oil spills, hazardous substance releases, and vessel groundings on marine and coastal natural resources. There is no one-size-fits-all approach to damage assessment. We must therefore custom-tailor our technical approach for each pollution or grounding event. We first determine whether impacts to natural resources have occurred and whether it is appropriate to proceed with a Natural Resource Damage Assessment (NRDAInvestigation performed by trustees to identify injuries to natural resources caused by oil spills, hazardous substance releases, and grounding incidents in National Marine Sanctuaries, and plan restoration activities. The goal of NRDA is to restore natural resources and compensate the public for lost recreational use.). We collect time-sensitive data; evaluate available research and information about the type of injury; and determine what species and habitats are likely to have been affected. If we determine that habitats or wildlife have been harmed or could experience significant impacts, we often proceed with a full damage assessment. During this phase, we conduct scientific studies to identify and quantify the negative impacts of the pollution or physical injury, including those resulting from cleanup or other actions taken as part of a response. Ecological studies evaluate how, and how badly, natural resources may have been injured. We also conduct economic studies to determine how recreational activities—such as fishing and swimming— have been affected. Restoration planning often begins early in the assessment process. We start considering restoration options even as we are investigating natural resource injuries. Based on the results of the injury assessment, we identify and evaluate restoration options. We then draft and seek public comment on a restoration plan that includes our preferred restoration actions. The draft plan outlines the methods we propose to restore impacted resources and compensate for injuries from the time of impact to full recovery. We take into account comments received from the public before finalizing the restoration plan. Cooperative assessments encourage settlements and offer responsible parties a role in planning restoration actions without undermining the trustees’ responsibilities. Collaboration generally results in lower damage assessment costs, a reduced risk of litigation, and shorter time between injury and restoration. The goals of this cooperative process are to expedite the restoration of injured natural resources, as well as to encourage innovative approaches.